It seems that Listener setters’ pseudonyms are getting weirder and weirder. This week, we had Mountain Ledges, which was probably just an anagram of his name, Emanuel St Dingo perhaps… or perhaps not! His puzzle (or hers — Melanie Godstun?) seemed as though it should be straightforward enough with only nine clues requiring special attention. These would lead to one or more extra letters in the wordplay, resulting in some squares containing two letters. Replacing them with dots and joining them up would make everything clear. Oh, and a thematic phrase would need replacing. 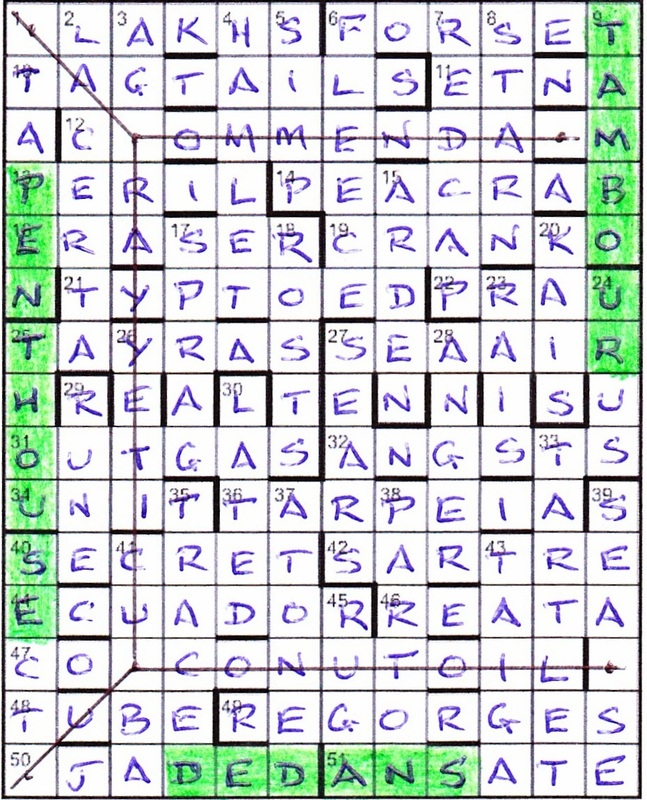 I started on the across clues, and a dozen were slotted in within thirty minutes, and nicely spread round the grid. Thirty minutes later and an equal number of down entries were in. Unfortunately, none of the clues led to any extra wordplay letters, which was disappointing. Now the reason why I was flummoxed by these special clues was that I got the letter counts all wrong. I thought that an entry count of (6) would lead to a 6-letter word + one superfluous wordplay letter, with one square containing two letters. It was only when I finally got 1ac Vast quantities: hectolitres — a thousand in this sense (6) giving HL (hectolitres) + A + K (thousand) + HS (in this sense) that I realised my stupidity: the two letters in some squares were formed by one from the across entry and one from the down! With the grid nearly full, I could see that HAMP…NC…RT was trying to give me HAMPTON COURT, and I realised that I hadn’t identified the clues with more than one extra letter in the wordplay. Mountain Ledges was being extra devious with 12ac COMMENDAM and 39dn SEASE. These needed two letters to go into one unchecked square — C[M]OMMENDA[TO]M and SEA[OU]SE. Cunning stuff! Luckily, the endgame was pretty easy. At first, I thought we might be threading our waay through the famous maze, but it didn’t take me long to see JEU DE PAUME across the centre of the grid. I hadn’t heard of this before, but Chambers gave me REAL TENNIS. It transpires that the game had originated in France back in the 16th century, or even before, but without rackets. With PENTHOUSE, DEDANS and TAMBOUR around the grid, it was obvious how the five straight lines should be drawn. It all represented the plan of a Real Tennis court. There is a court in Holyport, the other side of Maidenhead from where I now live. It is fascinating to see how the layout developed and even more fascinating are the rules which seem to be outrageously complex. There’s also a reference to the club at Falkland Palace in the clue to 26dn Door at Falkland Palace stopped short international mountain-dweller (4) (YETI). Thanks for some real entertainment this week, Mountain Ledges… or may I call you Emanuel or Melanie! This entry was posted on 3 June 2016 at 4:00 pm	and is filed under Solving Blogs. You can follow any responses to this entry through the RSS 2.0 feed. You can leave a response, or trackback from your own site.